Last time we went out to visit our daughter in Portland Oregon, she took us to some funky little shops around her St John's neighborhood. I found this fabulously sparkly piece that had to come home with me...only $20! How could I possibly leave it behind? However, when the young woman working there asked me what I would wear it with, I blithely replied that I'd probably be taking it apart. She paled visibly. Maybe I shouldn't have said that...? Maybe I shouldn't even do it...? What do you think? Definitely split that bling apart! Wonder why the salesgirl seemed troubled? Any chance she MADE this? Probably she's just never heard of cannibalizing jewelry LOL. Ha! I can just see her face! Of course you should take it apart! 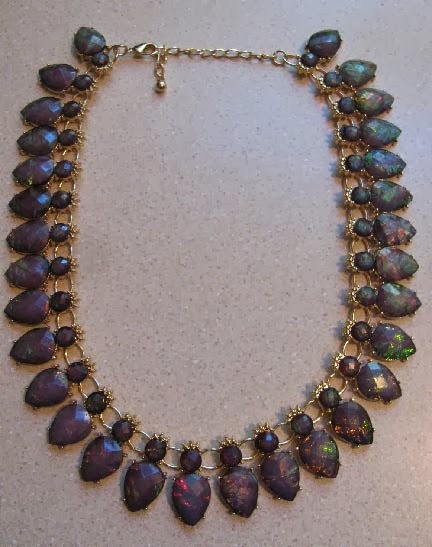 While it is an attractive necklace, I know you will create several pieces that really show off the color and depth of those stones. Am I correct that they are some type of opal? @Shirely...thank you for the vote of confidence! I doubt that they are really stones. 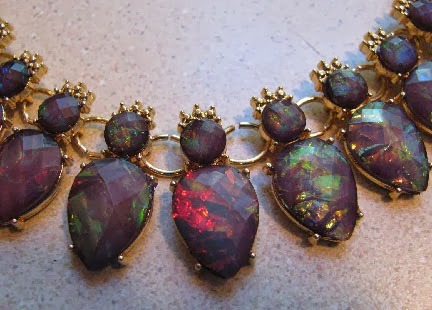 They look and feel like resin imitations of opal. They are REALLY sparkly though! Oh I agree with the others. Even as pretty as it is....I know you can do better with it! My first thought was what could be made from it. Sooooo many possibilities. Just make sure to let us see what you make! Definitely take it apart! The salesgirl didn't know how you can transform that one piece into several even-more-beautiful pieces! Tear that baby apart. OMG fire opals already in a setting! You got a fabulous deal. I like going to thrift stores and told the person at the counter I would probably tear them apart to make something more updated. She just about passed out. As you long as the piece isn't one of those vintage finds that are really worth some money, think Miriam Haskell, I would take it apart. I once bought a pin for $5 at a church thrift store. It was worth $75 dollars in reality. However I also bought at the same place 2 old Swarovski bead necklaces which I promptly took apart to repurpose the clasps, and beads. What to do with hinges? Halloween special at The Best Beads!